Saturday afternoon was an up-and-down affair for No. 18 UCF, but the Knights prevailed over UConn, 49-24, at Spectrum Stadium. The Knights (9-0, 6-0 AAC) roared out to a 21-3 lead in the first quarter of Saturday’s game before cooling off in the second and third quarters. The Huskies (3-7, 2-5 AAC) were able to hang around thanks to some self-inflicted issues for the Knights. The offense especially struggled in the third quarter, failing to score. It was just the second quarter of the season that the unit was held scoreless, with the other coming on Sept. 23 at Maryland. The Huskies got within 28-17 early in the third quarter, but the Knights were tough enough on defense to compensate for some of the offensive struggles. UConn went just six-for-15 on third downs, with UCF coming up with several stops on third-and-short situations. The offense came alive again in the fourth quarter, allowing the Knights to coast to a 49-24 victory. Milton finished the day with 311 passing yards, two passing touchdowns, 52 rushing yards and a rushing touchdown. It was his fifth 300-yard passing game of the season, which ranks him third in program history. 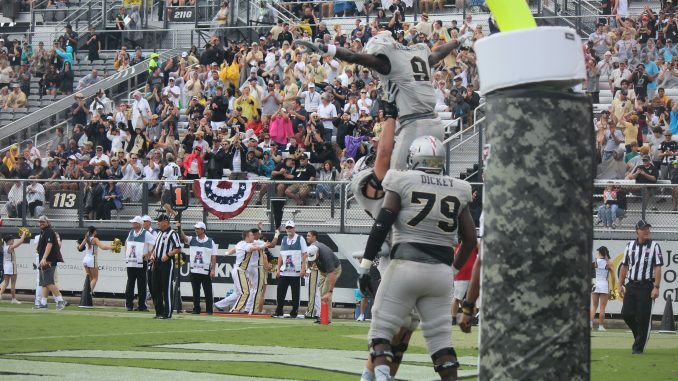 What we learned: The UCF offense is human after all. The Knights were outscored 14-7 in the second and third quarters due to mistakes and lack of execution. Those struggles were on the heels of a less-than-stellar offensive output at SMU last week. The hot start on Saturday against UConn felt like the norm for the Knights, but they uncharacteristically fell into some trouble in the middle of the game. Despite that, they bounced back. After a scoreless third quarter, UCF responded with a 21-point fourth to walk away with a comfortable win. Davis was a bright spot on the offense throughout the day, catching eight passes for 95 yards. What went right: Offensively, the Knights continued to put up huge numbers, even with their struggles in the third quarter. They put up 49 points and scored six of their seven touchdowns on drives of three and a half minutes or less. By the end of the day, they totaled 519 yards. UCF has now scored 40 points or more in six of its nine games this season, while putting up 450-plus yards in eight games. What went wrong: Penalties continued to be an issue for UCF on Saturday afternoon. Even with all of the success the team has had throughout this season, clean games have been hard to come by. UCF finished the day with 10 penalties for 84 yards. The Knights were able to overcome penalty yardage throughout the day, using their big-play ability to erase some mistakes. On a positive note, UCF was able to take advantage of UConn’s mistakes. The Huskies finished with eight penalties for 79 yards. Offensive player of the game: Redshirt junior Tre’Quan Smith. The big-play ability of the UCF offense often comes courtesy of Smith, who continues to shine in 2017 with the Knights’ prolific offense. He finished Saturday’s game with seven catches for 120 yards and a touchdown. It was the 10th 100-yard receiving day of his career, which ranks him third in school history. Smith had a major block on a 65-yard touchdown run by freshman Otis Anderson, who also had a big game. Anderson lost a fumble in the third quarter, but came back with the long touchdown run to finish his day with 84 yards and two touchdowns on the ground. It was the first multi-touchdown game of his career. Defensive player of the game: Redshirt senior Shaquem Griffin. The leader of the defense came up big in several key spots throughout the day, finishing with five tackles, a sack and a quarterback hurry. Junior quarterback David Pindell ran for 96 yards on the day, showing off some impressive elusiveness. The Knights still managed to rack up three sacks, one of which came from Griffin after Pindell avoided multiple defenders. Junior Mike Hughes came up with another big play on Saturday, intercepting Pindell in the first half. UCF returns to action next Saturday (Nov. 18) at Temple (5-5, 3-3 AAC) before returning home on Black Friday to host USF (8-1, 5-1 AAC).